Hi all. Today's post is a guest post by my uncle, environmentalist, and photographer, Ray Goodwin. He is also the author/photographer/owner of the Sonoran Connection blog. Regular readers of my blog will know that he was the one who first got me into photography. I have also long admired his dedication to environmental causes and I asked him to write this guest post about how he uses his photography to promote environmental causes. Henry Beston’s words in his book "The Outermost House", written in 1927, changed the course of my life and the way I think about nature and it’s steady decline. With words so eloquent Henry painted a picture in my mind of the great abundance in nature that existed early in the 20th century along the Massachusetts coast. As I read about the huge flocks of shorebirds that Henry described in his book, an awareness of just how much has already been lost crept into my being. I found myself longing to see what he saw, to be where he was and to wrap myself in a world that frankly has changed forever. In 1949 Henry Beston wrote in the forward of his eleventh printing of "The Outermost House" the following; “Nature is part of our humanity, and without some awareness of that divine mystery man ceases to be man.” Because of Henry, who 83 years ago set to paper words that changed my life in the 21st century, I now believe that I too can change someone’s life, perhaps 83 years from now. I believe, as Henry did, that nature is the very essence of who we are and that we have a responsibility to care for our planet. In his book all those years ago he describes a “new danger” of “slop” which remains after crude oil is distilled and which is pumped into southbound tankers and dumped at sea. His description of Arctic birds alighting in this oily mess and inevitably dying remains with me today. Even then the evidence of the coming environmental disasters was on the minds of people who observed nature. For years I was an observer of nature; enjoying what remained, what had been preserved by others, and not really understanding the magnitude of the decline that was taking place in the natural world. Once aware though, I began to look for ways to not only observe nature but to help preserve it. My journey had begun. As a semi professional photographer with a penchant for all things natural, I spend as much time as possible photographing wildlife and wild lands throughout Arizona. The Sonoran Desert where I live is one of the most ecologically diverse areas anywhere, so opportunities for photography abound. I have to admit I love taking pictures, but I wanted to find a way to use my skills to help the environment. I decided to offer my services as a photographer to environmentally minded organizations free of charge. A simple idea that can best be illustrated by a single photograph. 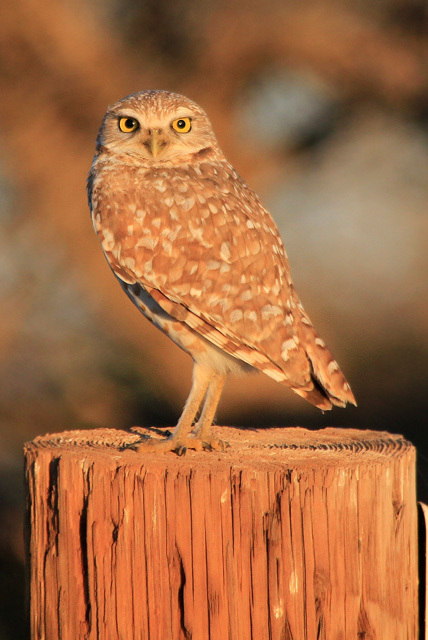 Southern Arizona is home to many endangered species, including the burrowing owl. The burrowing owl is a small bird that makes its home in burrows underground, usually made by other animals. As luck would have it, I happened upon a pair of the owls by the side of the road after taking a wrong turn early one morning in farm country. One immediately flew away into the fields but the other stood it’s ground near it’s burrow allowing me the chance to capture many wonderful images of the sun lit bird. By the time I took this picture, I had already been published in the newsletter of the Coalition for Sonoran Desert Protection, a coalition of more than 30 local and national organizations committed to the preservation of the Sonoran Desert. Once again, they contacted me to see if I had any photos included in a list of Pima County endangered species for inclusion in their upcoming newsletter. I offered and sent the burrowing owl photos. A single photograph has had a tremendous impact on this project and has assisted this organization in its quest to save the Sonoran Desert for future generations, and I couldn’t be happier. I will always be proud of this small contribution and hope to make many more like it in the future. What could be better? I get to do what I love and help the environment doing it. There are many, many ways to help save our planet so please get involved. Perhaps one photograph at a time! I know this can be a thorny subject as many nature photographers are opposed to giving away photographs free, because they need to make a living. And I agree to some extent. I think it is important however, to give back to the places and subjects that we photograph. I have donated the use of several photos for education to the National Park Service and USFWS. What do you think?